Ed snapped this picture of his riding buddy deciding who will go first, him or the free-range cow. As I mentioned in a post I wrote a little over a week ago, Ed had a desire to ride the Arizona Backcountry Discovery Route on his motorcycle. Well, last weekend he got to live part of that dream. 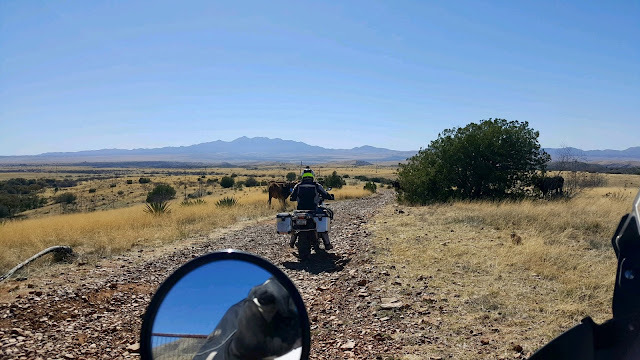 "The Arizona Backcountry Discovery Route (AZBDR) is a 750-mile scenic ride across the state of Arizona, beginning at the Mexico border and finishing at the Utah border. This South to North route consists of mostly remote dirt roads and winds through the remote high desert country, jagged canyons, wild lands, pristine mountain ranges, and a surprising number of water crossings. It passes through iconic locations including the Mogollon Rim, Sunset Crater National Monument, Grand Canyon and the Navajo Nation. The route includes dirt, gravel, and pavement surfaces and may include rocks, ruts, sand, mud, and snow depending on the time of year and conditions. The route can be completed in 4-6 days depending on pace, and is also accessible by four-wheel drive vehicles, as the entire route is at least double-track." He and a friend started at the southern end of the route, on the border Mexico and Arizona. He made it to Flagstaff before we had to come home to go back to work. While the guys rode the BDR, taking trails in the wilderness, I took the nearest roads and met up with them at several spots along the way. He and a friend started at the southern end of the route, at the Coronado National Memorial, then rode along the Arizona-Mexico border for a bit, before heading north. While the guys rode the BDR, taking off-road trails in the wildness, I drove the pickup truck on the nearest real roads and met up with them along the way. We landed in Globe the first night, and four days later we were all in Flagstaff. Unfortunately, we got called for a load and had to head back to Tucson for work but Ed plans to finish the portion from Flagstaff to the Utah border soon. There was a lot of scenery to see, especially further north as the elevation and landscape changed, and I'll post a few pictures that each of us took along the way.